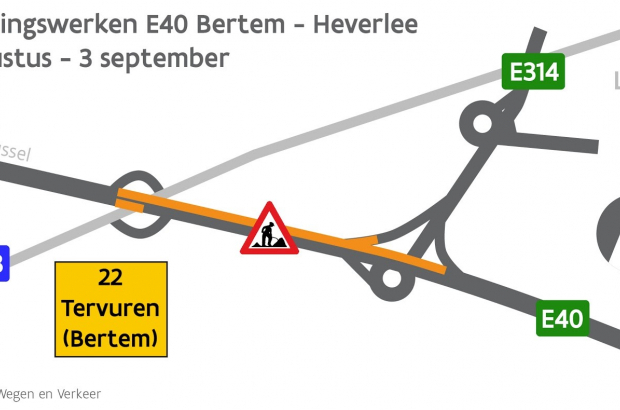 Drivers should avoid heading into Brussels on the E40 from Leuven for the next 10 days, as the Brussels-bound motorway is reduced to just one lane due to emergency roadworks. The Flemish Roads Agency is expecting "very serious traffic problems" from 9.30 on Friday 24 August until 6.00 on Monday 3 September, the first day of the new school year. Two lanes will be closed to traffic between the junction with the E314 and Bertem, where the exit 22 sliproad is shut. A spokesman said: "We will proceed in the coming days with urgent repair work on the E40. It is the concrete below the asphalt that has to undergo major repairs. "We're doing the work before the start of the school year, to avoid the worst traffic jams, but there will still be delays. We advise drivers to avoid the E40 and opt instead for the train or working from home."